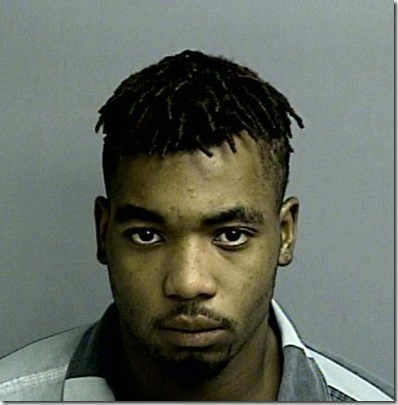 Montgomery County, Texas – December 1st, 2015: On Monday, at approximately 2:50 a.m., Deputies with the Montgomery County Sheriff’s Office Patrol Division were dispatched to a reported robbery that had occurred at a business, Walmart, located in the 1000 block of Sawdust Road, in Spring, Texas. Upon law enforcement arrival, it was reported that a male approached a complainant in the parking lot and requested to utilize her cell phone. After utilizing the cell phone to make several calls, the male then brandished a handgun, pointed the handgun at the complainant’s face, and instructed her to back up. The suspect then proceeded into a car and fled the location. The complainant was able to provide a description of the suspect and suspect vehicle. On the same date, at approximately 5:40 AM, Deputies with the Montgomery County Sheriff’s Office Patrol Division responded to another reported robbery at the same location. Reportedly when a complainant had pulled up to the fuel center at this location, another vehicle pulled up on the opposite side of the pumps. A male stepped out of the vehicle and approached the complainant. The male reportedly brandished a handgun and demanded the complainant’s phone. The complainant refused to comply. The suspect then proceeded to reach into the complainant’s vehicle, as if to look for the complainant’s cell phone. The complainant ran to the clerk at the station directing the clerk to call, “911”. When seeing this, the suspect proceeded into his vehicle fleeing the area. The description of the suspect and suspect vehicle were the same in the earlier reported robbery. On the same date, at approximately 7:45 AM, Deputies with the Montgomery County Sheriff’s Office Patrol Division responded to another reported robbery that occurred at business, HEB, in the 3500 block of Rayford Road. Reportedly a male grabbed a cell phone from a complainant that was at that location. The complainant gave chase, with the suspect fleeing on foot. Reportedly the suspect stopped at some point and brandished a handgun in the direction of the complainant. The suspect was able to flee to a vehicle and then leave the location. The description of the suspect and vehicle were the same as the two previous reported robberies. Shortly afterward, Deputies with the Montgomery County Sheriff’s Office were dispatched to the nearby Spring Trails Subdivision. Reportedly a male was going door to door in the neighborhood requesting money for gas. The description of the male and the vehicle he was in possession of matched the suspect and suspect vehicle in the above listed robberies. Multiple units responded to the location. After an investigation, Deputies were able to identify the individual going door to door as the suspect in the above robberies. Two cell phones taken in the robberies, as well as a toy gun, were recovered from the suspect vehicle. It was additionally discovered that the vehicle that the suspect was in possession of was reported stolen out of the City of Houston. The suspect was arrested and transported to the Montgomery County Sheriff’s Office Criminal Justice Complex. The suspect was charged with three counts of aggravated robbery and one count of theft of a vehicle. The Montgomery County Sheriff’s Office Major Crimes Unit is investigating and that investigation is still on-going.